Howletts Hut is located below the 1682m Taumatamekura Peak and the last rest heading north before the infamous Sawtooth Ridge. 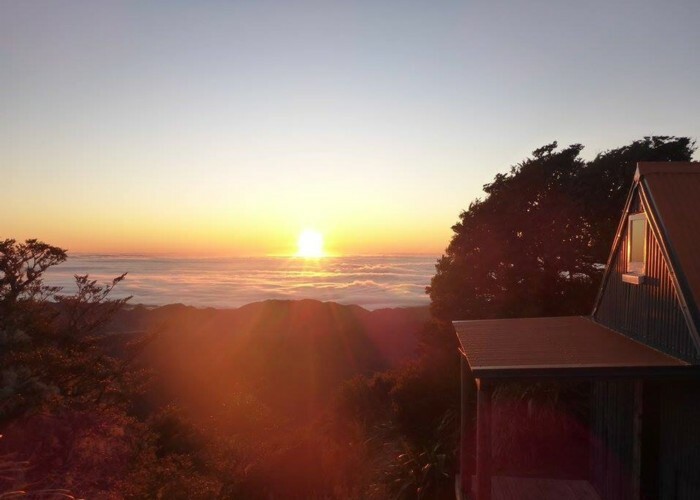 The hut sits in a sheltered hollow on the Daphne Ridge just where the tussock ends and beech forest starts to lap over the ridgeline, giving unimpeded views of the ranges and plains around Ongaonga. There is a new stove with coal flown in, and tank water. Sunrise from Howletts Hut • By Briar. Licence: C.
Howletts Hut is owned and maintained by the Heretaunga Tramping Club. Backcountry hut passes and tickets do not apply. For overnight stays, send donations to Heretaunga Tramping Club, PO Box 14086, Mayfair, Hastings 4159 (or email htc@orcon.net.nz for bank details). Added 7 January 2007 by madpommadpom. 7 revisions, most recently 3 April 2017 by MatthewMatthew. 202 views in the past year (17 per month).